Brighten your Urban Outdoors by adding a movable splash of color to your deck or patio. 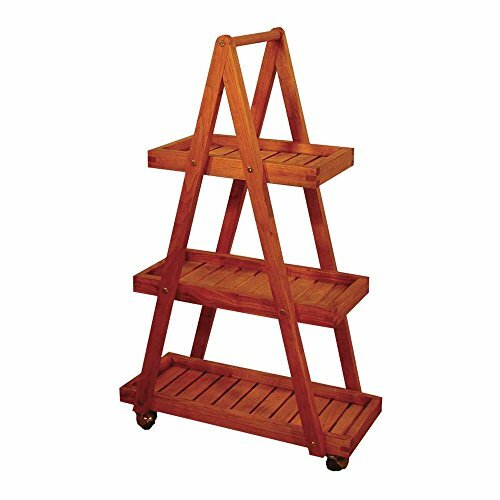 The three-tiered Quintana Flower Carthas durable casters and is ideal for displaying potted plants and flower baskets. The practical A-frame design makes it a useful workstation for artists and hobbyists for holding anything from paintbrushes to crafter's tools. Built from select kiln-dried Nyatoh Asian hardwood for enjoyment year after year, the dimensions are 24 in. L x 15 in. W x 36 in. H. Ready to assemble. If you have any questions about this product by Blue Star Group, contact us by completing and submitting the form below. If you are looking for a specif part number, please include it with your message.